Few Canon announcements have been as eagerly anticipated as the brand's answer to Sony's high-performing a-series, mirrorless full-frame cameras. Canon was extremely tight-lipped about the features of the soon-to-be-unveiled EOS R, the details of the new RF mount and the corresponding RF lenses – as well as mount adapters – that were coming down the pipeline, until right up to announcement time. Of course, most of those details were floating around the interwebs before the actual announcement was made, but the flood of NDA'd material arrived much later than is typical for a Canon announcement, not to mention one as highly anticipated as this one. It seems that Canon wanted to surprise and impress us. Now the question is, "Did they?" Everyone looking at the EOS R will appreciate its highlighted features differently, but the list above represents what I liked most about the camera's available feature set when the camera was announced. The most important of those features, in my opinion, is the first one – [nearly] full compatibility with Canon's existing EF-series lenses, including EF-S lenses, via an adapter. But Canon turned what may otherwise be viewed as an inconvenience (the use of an adapter) into three separate products, two of which have very nice benefits. The Mount Adapter EF-EOS R is the standard adapter. It is very low priced and does exactly what you'd expect. Want to change a setting quickly and conveniently with your left hand without moving your hand off the lens, essentially giving your older lenses the same functionality as Canon's new RF-series lenses? The Control Ring Mount Adapter is there for you. Want to add an easy-to-use, universal variable ND or circular polarizer to your kit? Just get the Drop-in Filter Mount Adapter and either filter can be used with every EF/EF-S/MP-E/TS-E lens in your existing kit. Canon definitely aimed to impress with the EOS R's autofocus capabilities with an AF coverage that spans nearly the entire frame, sensitive down to -6 EV (with ultra wide aperture lenses) and eye tracking AF. Of course, we'll need to test the camera thoroughly to see if Canon's new AF system holds up well against the competition, but on paper, at least, things look promising. Canon's Dual Pixel CMOS AF sensors are well regarded for subject tracking in video mode, and good AF tracking is especially necessary when recording in 4K; we expect the EOS R to perform equally well compared to its DSLR predecessors. How annoying is it when your new camera is not compatible with any of your existing memory cards? The EOS R uses the perennial standard – Secure Digital – so you'll likely be ready to start shooting as soon as you open the box and charge the battery. If you already have an LP-E6N/LP-E6 battery charged (very likely), then you won't even have to wait that long. If you're accustomed to shooting with a battery grip, then you'll really appreciate that the EOS R's battery grip, the BG-E22, is scheduled to be available when the camera ships. As far as the lenses go, the R-series kit lens, or RF 24-105mm f/4L IS USM, seems to be the perfect choice for a full-frame general purpose zoom lens. It will be extremely useful and will easily cover a wide range of situations including portraiture, outdoor weddings, product, architecture and landscape needs. Personally, I don't find general purpose lenses to fill me with inspiration. Like Swiss Army knives, they're great at doing so many things (and get used so often because of their versatility) but don't necessarily inspire me to carve a statue with the tool. I find the RF 35mm f/1.8 IS STM Macro lens to be especially interesting as it'll be the first 35mm macro lens from Canon designed for a full-frame sensor camera and it is the widest aperture macro lens in the Canon lineup. The other two lenses, however, were designed to provide the "wow" factor worthy of the new camera mount. The RF 28-70mm f/2L USM is the world's first general purpose zoom for full-frame cameras with an f/2 constant max aperture. Want to freeze motion in low light situations? With a 1-stop wider aperture compared to an f/2.8 max aperture zoom, you can double your shutter speed without resulting in a twice-as-high ISO, resulting in better subject separation and cleaner, less noisy images. Bryan spent hours using this lens including at a very low light event and thinks it is awesome. While the lens is not small or light, it is an ideal event lens and this lens alone is a great reason to buy an “R”. Want to really blur out the background? Try reaching for Canon's newest f/1.2 prime, the RF 50mm f/1.2L USM, and watch the background melt away. This lens takes full advantage of the new RF mount with increased sharpness and contrast over the entire frame and should prove to be a favorite prime for many photographers. This might be the fast 50mm lens you’ve been waiting for. When looking at where the EOS R falls a bit short, two missing features immediately come to mind – the camera doesn't have dual memory card slots or in-body sensor stabilization. Both of those features would be greatly appreciated by photography pros and amateur shooters alike. Fortunately, memory cards don't fail very often and we've been creating sharp Canon images without sensor stabilization all this time. How? Through good camera techniques (elbows in), camera-shake negating shutter speeds, lens IS and tripods/monopods. Keep in mind, the R-mount's new communications protocols allow much more data to flow between the lens and the camera body. This results in a more effective in-lens stabilization (for those RF lenses that feature IS) because the lens can receive information from the camera itself. So while you may not get the benefits of stabilization for every lens in your kit, you'll see even better performance than you're used to with RF lenses featuring IS. Some will lament the 1.75x crop when recording in 4K. However, keep in mind that the EOS R is compatible with EF-S lenses, and there are a ton of ultra wide-angle EF-S lens options, so that concern is mitigated to some degree. And while we're on the topic of lens compatibility, it's important to note that the RF-mount is incompatible with Canon's APS-C EF-M mirrorless lenses. I think this incompatibility shows Canon's lack of foresight in regards to its development of a full-frame mirrorless system and puts the future of the EOS M-series into question. If someone purchases a Canon APS-C DSLR, the camera is compatible with APS-C specific lenses (EF-S) and those designed to cover full-frame sensors (EF/TS-E/MP-E). If that same person wants to upgrade to a Canon full-frame DSLR, all EF/TS-E/MP-E lenses they had acquired would be compatible with their next camera (of course, the same is not true for EF-S lenses). However, there is no easy upgrade path to a full-frame camera for EOS M-series owners. If transitioning to a full-frame mirrorless setup, no native EF-M lenses will be compatible with the new camera. Ultimately, that means a user must start with a blank slate when making the mirrorless APS-C to full-frame jump, a prospect that far fewer consumers will consider compared to DSLR users. 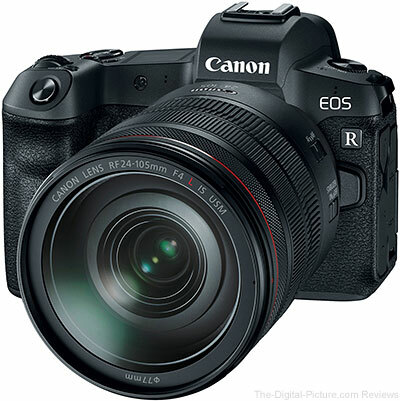 The Canon EOS R was designed to appeal to a very wide market in order to get the EOS R system off to a good start. This is the beginning of a new line of cameras. I have no doubt that we'll see dual memory card slots in a future EOS R system camera, and whatever drawbacks we find in the EOS R will be refined as the series matures. Some will miss the multi-controller joystick for choosing AF points, but using Touch and Drag with the LCD works very well (better in some regards), though it does take some practice. That said, the EOS R is a very capable camera with an excellent feature set, many of those features being completely new to the EOS system. Bryan has just returned from the Canon announcement event with a huge amount of information and experience (over 3,000 images captured) – and with a Canon EOS R, Canon RF 24-105mm f/4L IS USM Lens, Canon RF 50mm f/1.2L USM Lens and an EF-EOS R adapter in hand. He’s excited! Stay tuned for much more information. Preorders for the Canon EOS R and RF lenses will go live Tuesday night at midnight (12:00am Wednesday, technically). Please keep us in mind when placing your preorders. Using our links doesn't cost you anything extra, but provides the vital support necessary to keep the site going.